Buying a new home is one of life’s most gratifying experiences and is likely the biggest investment you will ever make. Be sure not to overlook the single most important step in the process of closing on your home – the purchase of owner’s title insurance. An owner’s title insurance policy provides both peace of mind and financial protection against covered prior losses and defects, and provides legal defense for covered risks. There can be any number of prior problems that remain undisclosed after the most meticulous search of public records. These prior hidden “defects” may not be discovered for months or even years after you purchase your property. You could be forced to spend substantial money on a legal defense to protect your rights. 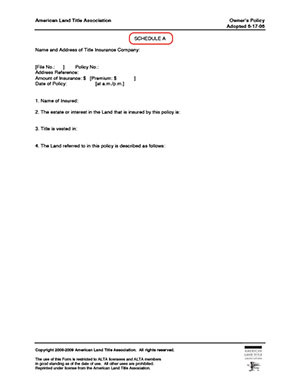 Make sure you purchase an owner’s title insurance policy to protect your investment. For a one-time fee an owner’s policy can protect your important property rights for as long as you or your heirs own the property. The enhanced coverage Homeowner’s Policy provides the most complete title coverage available, including protection against a number of covered matters beyond those included in a standard coverage policy. 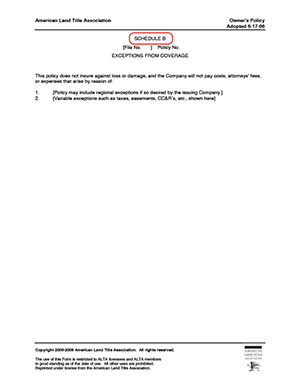 Below is a comparison chart showing the differences in coverage given under a standard ALTA owner’s policy and an enhanced coverage Homeowner’s Policy (EHP). 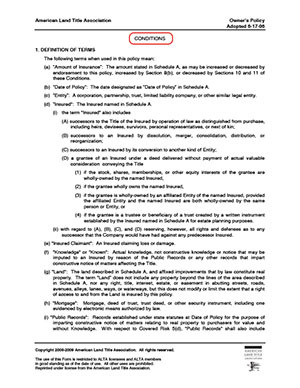 Notes: Covered risks listed are occurring after the policy date. This policy is for use, when requested, for one-to-four family residences only. It should not be used for vacant land or for new construction. If issued on new construction, you must independently verify the payment of all lienable construction costs and the issuance of all required occupancy permits. Deductibles may apply with respect to certain of the coverages afforded in this policy. 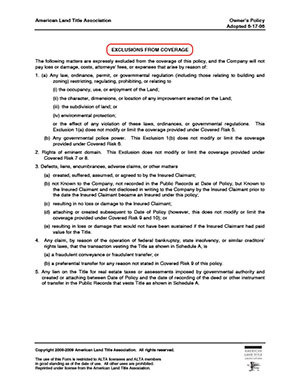 Contact Innslake Title for specific information as to any deductibles which pertain to the coverages in the Homeowner’s Policy of Title Insurance. For additional questions contact Innslake Title. 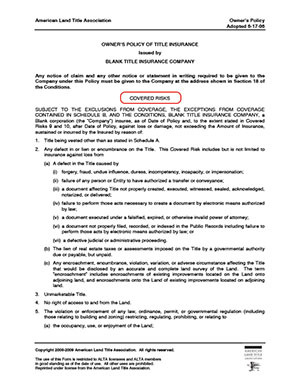 *Coverage for the item is not provided in the ALTA Owner’s Policy UNLESS notice of the covenant, ordinance, statute or regulation is recorded in the public land records. As an example, the cost for an owner’s policy for a home in Washington, D.C., listed at $474,000 and assuming a 20 percent down payment, is around $1,100. Over the average duration of homeownership, that spreads out to about $85 annually or about $7 per month. The longer you own your property, the overall cost decreases even more.